There’s a natural charm and freshness to this enchanting arrangement of roses and tulips that really suits the romantic mood. This gift has a very personal feel – it’s more informal than a bouquet, but every bit as beautiful. She’ll be delighted. 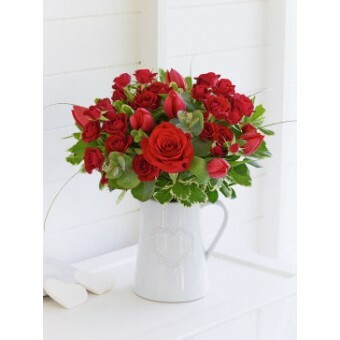 Featuring a large headed red rose, 3 red spray roses and 6 red tulips with eucalyptus, salal, pittosporum and bear grass, presented in a white ceramic jug with embossed heart design.